Our nunchaku are all one of a kind martial arts weapons. Due to the nature of the use of the nunchaku we will only exchange or return items that are damaged in shipping or have an existing defect at the time of shipping. Nunchaku that are damaged during use will not be replaced. See nunchaku care Our policy lasts 7 days. If 7 days have gone by since your purchase, unfortunately we can’t offer you a refund or exchange. To be eligible for a return, your item must be unused and in the same condition that you received it. It must also be in the original packaging. Since all our nunchaku are one of a kind if a replacement is sent it will be as close to the original items make and model as possible. Exact duplicates are not possible. If you’ve done all of this and you still have not received your refund yet, please contact us at sales@usanunchaku.com. We only replace items if they are defective or damaged. 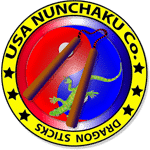 If you need to exchange it for the same item, send us an email at sales@usanunchaku.com and send your item to: USA Nunchaku 914 Indiana Ave, Lemoyne, PA, 17043, United States. To return your product, you should mail your product to: USA Nunchaku 914 Indiana Ave, Lemoyne, PA, 17043, United States..